Find A Grave Memorial# 55731804. "United States Census, 1900," database with images, FamilySearch (https://familysearch.org/ark:/61903/1:1:M3Y6-9RG : 20 January 2015), Charles R Ordway, Hooksett town, Merrimack, New Hampshire, United States; citing sheet 17A, family 355, NARA microfilm publication T623 (Washington, D.C.: National Archives and Records Administration, n.d.); FHL microfilm 1,240,949. "New Hampshire Birth Records, Early to 1900," database with images, FamilySearch (https://familysearch.org/ark:/61903/1:1:FLGT-R3J : 12 December 2014), Fannie Myrtie Ordway, 21 May 1885; citing Goshen, Sullivan, New Hampshire, United States, Bureau of Vital Records and Health Statistics, Concord; FHL microfilm 1,001,026. 1880 United States. Bureau of the Census. 10th census, Illinois, 1880 federal census : soundex and population schedules, Washington: The National Archives, ([19--?]) , FHL Film 1254194; National Archives Film T9-0194; Page 306D. "New Hampshire Marriage Records, 1637-1947," database with images, FamilySearch (https://familysearch.org/ark:/61903/1:1:FLHQ-ZP8 : 12 December 2014), George E. Ordway and Abbie M. French, 03 Jul 1895; citing Goffstown, Hillsborough, New Hampshire, Bureau of Vital Records and Health Statistics, Concord; FHL microfilm 1,001,288. 1880 United States. Census Office. 10th census, 1880 federal population census, Washington, District of Columbia: National Archives and Records Service, ([19--]) , Census Place: Dunburton, Merrimack, New Hampshire; Roll T9_766; Family History Film: 1254766; Page: 252.1000; Enumeration District: 176; Image: 0333. New Hampshire Death Records, 1654-1947, at https://www.familysearch.org, record of Charles A. Ordway. 1880 United States. Census Office. 10th census, 1880 federal population census, Washington, District of Columbia: National Archives and Records Service, ([19--]) , FHL Film 1254763; National Archives Film T9-0763; Page 107B. Harrison Colby, A genealogy of the descendants of Abraham Colby and Elizabeth Blaisdell, his wife, who settled in Bow in 1768, , at https://archive.org/details/genealogyofdesce00colb . Concord, N.H.: Printed by the Republican Press Association, (1895) Microfilm #896944 of the Family History Library, Salt Lake City, Utah, pp. 144-5. 1880 United States. Census Office. 10th census, 1880 federal population census, Washington, District of Columbia: National Archives and Records Service, ([19--]) , FHL Film 1254766; National Archives Film T9-0766; Page 252A. "New Hampshire Births and Christenings, 1714-1904," database, FamilySearch (https://familysearch.org/ark:/61903/1:1:FDJR-M3X : 12 December 2014), Jonathan C. Ordway, 18 Mar 1834; citing BOW,MERRIMACK,NEW HAMPSHIRE; FHL microfilm 0015553 IT 14. "New Hampshire Births and Christenings, 1714-1904," database, FamilySearch (https://familysearch.org/ark:/61903/1:1:FDJR-M38 : 12 December 2014), Jonathan C. Ordway, 21 Mar 1821; citing BOW,MERRIMACK,NEW HAMPSHIRE; FHL microfilm 0015553 IT 14. Bow (New Hampshire). Town Clerk, Bow, New Hampshire town records, 1757-1977 and births, marriages, and deaths,1826-1915, Salt Lake City, Utah: Filmed by the Genealogical Society of Utah, (2001) , p. 328. 1880 United States. Census Office. 10th census, 1880 federal population census, Washington, District of Columbia: National Archives and Records Service, ([19--]) , FHL Film 1255382; National Archives Film T9-1382; Page 511B. Massachusetts Vital Records, 1841-1910, , Vol: 176 ; Page: 90. Town and City Clerks of Massachusetts, Massachusetts Vital and Town Records, Provo, UT: Holbrook Research Institute (Jay and Delene Holbrook), , Lowell > Births, Marriages and Death > 5580. "New Hampshire, Birth Records, Early to 1900," index and images, FamilySearch (https://familysearch.org/pal:/MM9.1.1/FL2R-1Z6 : accessed 30 Nov 2012), Lorenzo Colby, 06 Oct 1823. 1880 United States. Census Office. 10th census, 1880 federal population census, Washington, District of Columbia: National Archives and Records Service, ([19--]) , FHL Film 1254552; National Archives Film T9-0552; Page 402A. Harrison Colby, A genealogy of the descendants of Abraham Colby and Elizabeth Blaisdell, his wife, who settled in Bow in 1768, , at https://archive.org/details/genealogyofdesce00colb . Concord, N.H.: Printed by the Republican Press Association, (1895) Microfilm #896944 of the Family History Library, Salt Lake City, Utah, p. 128. 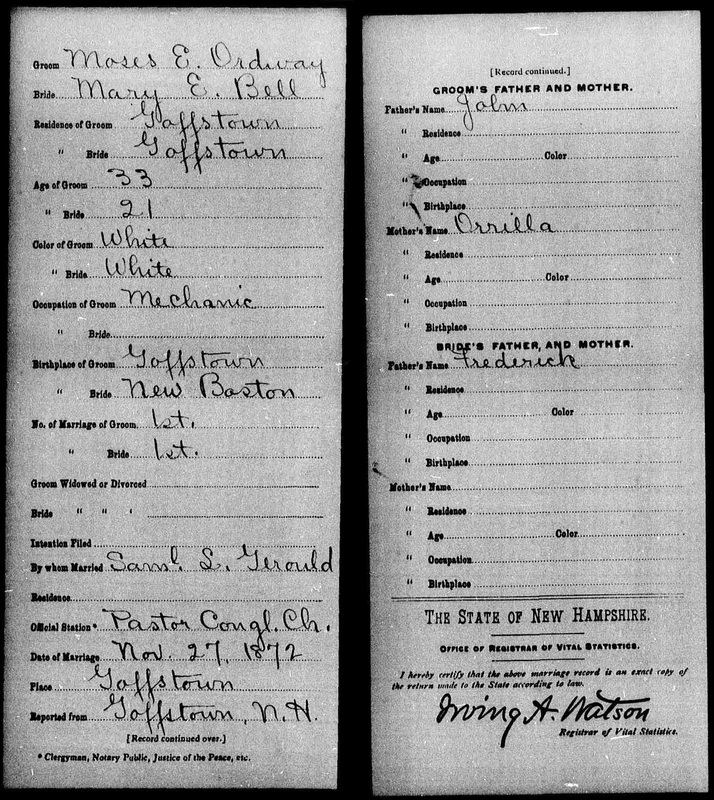 "New Hampshire Marriage Records, 1637-1947," database with images, FamilySearch (https://familysearch.org/ark:/61903/1:1:FLFX-4TV : 12 December 2014), Peter C. Rowell and Mary H. Elliott, 16 Sep 1851; citing , Bureau of Vital Records and Health Statistics, Concord; FHL microfilm 1,001,300. "United States Census, 1870," database with images, FamilySearch (https://familysearch.org/ark:/61903/1:1:MH5V-P52 : 17 October 2014), Peter C Rowell, New Hampshire, United States; citing p. 22, family 203, NARA microfilm publication M593 (Washington D.C.: National Archives and Records Administration, n.d.); FHL microfilm 552,345. 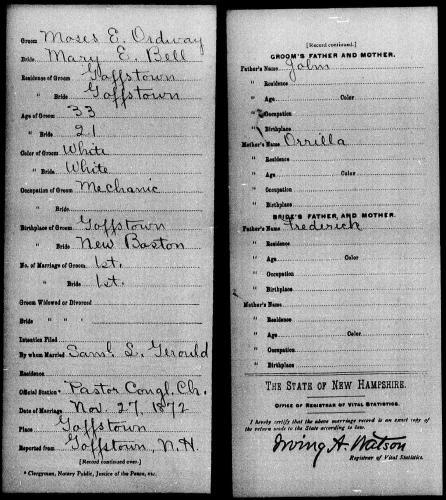 "New Hampshire Marriage Records, 1637-1947," database with images, FamilySearch (https://familysearch.org/ark:/61903/1:1:FLDT-F74 : 12 December 2014), Joseph W. Tufts and Mary S. Rowell, 14 Aug 1872; citing Allenstown, Merrimack, New Hampshire, Bureau of Vital Records and Health Statistics, Concord; FHL microfilm 1,001,310. Harrison Colby, A genealogy of the descendants of Abraham Colby and Elizabeth Blaisdell, his wife, who settled in Bow in 1768, , at https://archive.org/details/genealogyofdesce00colb . Concord, N.H.: Printed by the Republican Press Association, (1895) Microfilm #896944 of the Family History Library, Salt Lake City, Utah, p. 145, #477. "New Hampshire Birth Records, Early to 1900," database with images, FamilySearch (https://familysearch.org/ark:/61903/1:1:FLPH-8HW : 12 December 2014), Nancy Rowell, 23 Sep 1865; citing Hooksett, Merrimack, New Hampshire, United States, Bureau of Vital Records and Health Statistics, Concord; FHL microfilm 1,001,037. COLBY FAMILY & OTHERS at http://freepages.genealogy.rootsweb.com/~colby/colbyfam, /d481.html. 1880 United States. Census Office. 10th census, 1880 federal population census, Washington, District of Columbia: National Archives and Records Service, ([19--]) , FHL Film 1254765; National Archives Film T9-0765; Page 49D. 1900 United States. Census Office. 12th census, 1900 population census schedules, Washington, District of Columbia: Bureau of the Census Micro-Film Laboratory, ([197-]) , Census Place: Bow, Merrimack, New Hampshire; Roll: 949; Page: 1B; Enumeration District: 0142; FHL microfilm: 1240949. "New Hampshire, Marriage Records, 1637-1947," index and images, FamilySearch (https://familysearch.org/pal:/MM9.1.1/FLHQ-6HP : accessed 21 February 2015), Moses E. Ordway and Mary E. Bell, 27 Nov 1872; citing Goffstown, Hillsborough, New Hampshire, Bureau of Vital Records and Health Statistics, Concord; FHL microfilm 1,001,288. 1920 United States. Bureau of the Census. 14th census, 1920 population census schedules, Washington, District of Columbia: The National Archives, ([193-?]) , Census Place: Weare, Hillsborough, New Hampshire; Roll: T625_1012; Page: 7A; Enumeration District: 160; Image: 23.